What is the “Leipzig Foam Tester” ? Read more about our Service or send a quotation request. Rent or buy? Download Datasheet or take a look to the images. 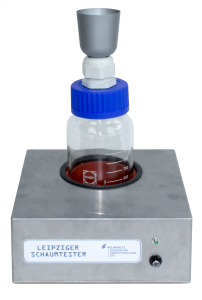 Fill test bottle half with fresh, active fermenter culture, add substrate to be tested and close culture bottle as described in the manual. 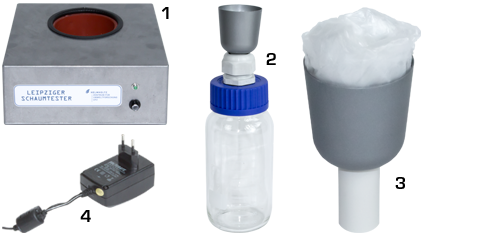 Place test bottle in the silicone heater and switch LEIPZIG FOAM TESTER on. Foam evolution in the test bottle during the next hours indicates increased tendency of the substrate to produce foam in the biogas reactor. Foam production in biogas plants can cause excessive damages and costs. Gas pipes can be clogged, sensors and other reactor components can be damaged, fermenter roofs can be lifted up and destroyed. Biogas escaping through safety vents or leakages into the environment is not usable for energy generation. Foam generation in biogas reactors is often triggered by unknown substrates. The LEIPZIG FOAM TESTER provides a simple way to estimate the foaming potential of a substrate in a laboratory-scale test kit.